Liverpool's American owners Tom Hicks and George Gillett have denied reports they are planning to sell the club. Dubai International Capital, which failed to buy the club a year ago, has been linked with a second attempt. 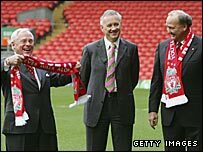 It has been rumoured DIC is planning to bid for the 50% stake in Liverpool owned by Hicks. A spokesman for the two Americans said: "Any suggestion Hicks and Gillett are contemplating a sale of the club or any portion of it is categorically untrue." DIC founder and chairman Sameer Al-Ansari was the man responsible for the takeover bid a year ago, but Liverpool owner David Moores had a last minute change of heart and opted to sell to the Americans. "It took me two weeks to get over that," said the 44-year-old al-Ansari, who is a Liverpool fan. "But it didn't dent my passion - I still go to every match when I'm here." Al-Ansari, who has also recently been linked with Sir Richard Branson's move to take over Northern Rock, has maintained contact with Liverpool chief executive Rick Parry. The club's current owners have come under fire from supporters recently after it emerged they had held talks with Jurgen Klinsmann about replacing Rafael Benitez as manager. Hicks and Gillett are in process of refinancing the loan they took out to buy the club and have the added pressure of an expensive new stadium to fund. It is uncertain how Gillett's position at the club would be affected should the DIC group buy his partner's share at Anfield.